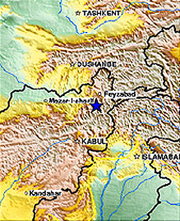 A major earthquake of magnitude 7.3 occurred in the Hindu Kush region of Afghanistan approximately 150 miles north-northeast of Kabul at about 7:08 a.m. Eastern Standard Time yesterday, March 3, 2002, according to early USGS reports. The intermediate-depth quake shook South Asia, from Afghanistan and Pakistan to northern India. The epicenter was in the remote province of Samangan, where a rock slide flattened 100 homes. At least 100 people are dead and hundreds more homeless. This earthquake is the strongest to hit the region since a magnitude 7.2 quake on Dec. 30, 1983, which killed 14 people in Pakistan and 12 in Afghanistan. A magnitude 6.9 quake based in the same region on May 30, 1998, killed more than 5,000 people.